Light, stable and precise. 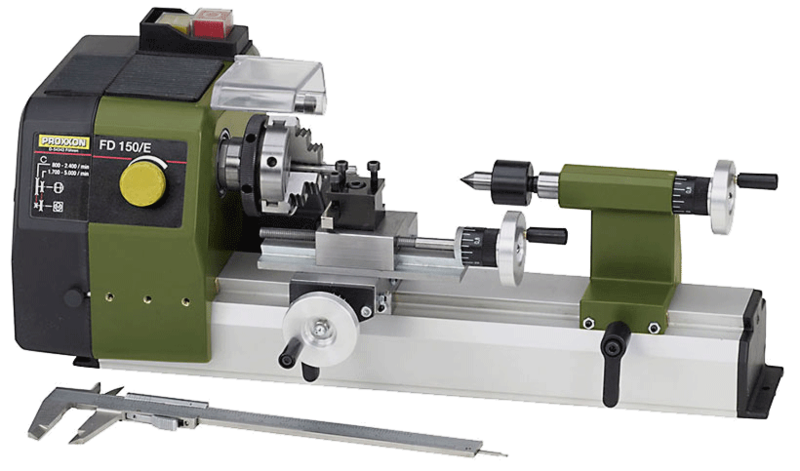 Spindle speeds up to 5,000rpm. Three-jaw chuck, self-centering (inside jaws 1.5 - 32mm), outside jaws 20 - 50mm). Is mounted on the cross slide in place of the tool holder. For producing convex and concave shapes, for turning radii or 3/4 spheres with radii of 32mm max. Height adjustable tool holder (boring tool tip adjustable from 30 through 45mm above cross slide) for use with FD 150/E, PD 250/E, PD 400 and older PROXXON lathes. Dimensions: base plate 67 x 50mm, height 55mm. Including finishing cutter 8 x 8 x 80mm. In wooden box with sliding lid. Of 1.5mm thick sheet steel, powder-coated. Bevelled edges at the front and back enable easy cleaning. Pre-drilled mounting holes for the secure stability of the FD 150/E. L 400 x W 165 x H 140mm. 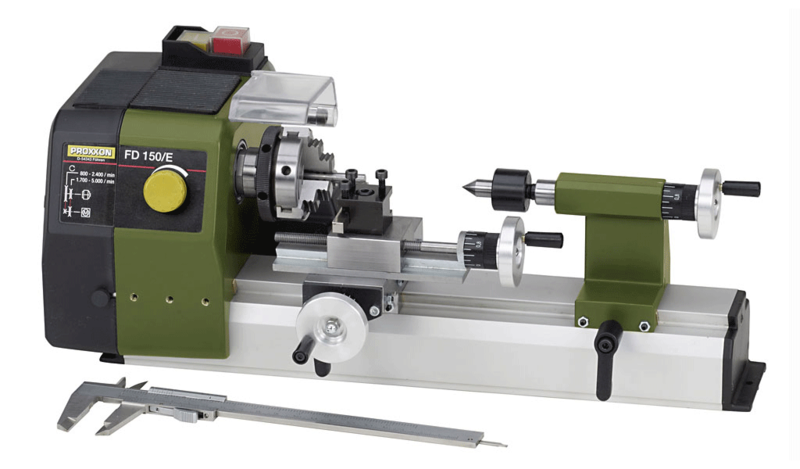 The lathe depicted here is not included in the scope of delivery. 6-piece turning tool set. Made of high-quality cobalt HSS steel. Ground. One each boring, roughing out, parting, finishing, right and left cutter. Size 6 x 6 x 65mm. For FD 150/E, supplied in wooden box. Drill chuck. Capacity 0.5 - 6.5mm. Industrial quality with high concentricity (allowed up to 10,000rpm). Complete with arbour B 10 x MK 0/short. For the tailstock of the FD 150/E. Offering high concentricity. May be reduced up to 0.5mm below their nominal diameter (intermediate sizes not required). D = 11.5mm, L = 18mm. One each of 2 - 2.5 - 3 - 4 - 5 - 6 and 7mm are included. With clamping nut M 16 x 1. Suitable for the main spindle of the FD 150/E. Supplied in a wooden box.